Earmuffs for Everyone! 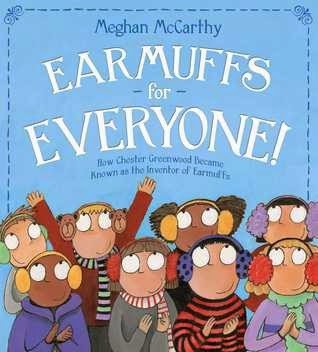 : How Chester Greenwood Became Known as the Inventor of Earmuffs by Meghan McCarthy. Grades 2-5. Simon & Schuster, January 2015. 48 pages. Review copy provided by my local library. First of all, there are her super cute, colorful illustrations. I love those big round heads and eyes. And then there are the subjects that she chooses to write about. One thing that I LOVE about children's nonfiction is that you're likely to run across subjects you never thought to think about. And this is one of those books. Did you know that a town in Maine celebrates Chester Greenwood Day every year, celebrating the guy credited with inventing earmuffs? Did you know that Chester Greenwood did not actually invent earmuffs? Some claim that Chester Greenwood invented earmuffs as a teenager, but his patent is actually for "improvements on the ear muffler", meaning that Greenwood improved on an invention that already existed. So, why is Greenwood the one getting all the credit? On the surface, this may look like a straightforward biography of the inventor of earmuffs, but Meghan McCarthy takes this book to the next level, investigating why Greenwood is credit with the invention and explaining how easy it is for facts to be lost or misinterpreted in history. These concepts come across in the simple text and are expanded in the substantial author's note where McCarthy provides more detail about how she searched for information as she researched this book. This is not only a fun read for kids who are interested in history, biography, and inventions, but a book that can contribute much to classroom discussions on researching history and questioning sources. Ain't Nothing But a Man: My Quest to Find the Real John Henry by Scott Reynolds Nelson and Marc Aronson explores the process of researching history for an older audience. These nonfiction picture books introduce children to the little-known inventors of Day Glo colors and bubble gum, respectively. Either would make a good readalike for kids interested in other off-the-beaten-path inventors. Hey, it's Nonfiction Monday! Head on over to the Nonfiction Monday Blog to check out what other bloggers are sharing this week.